Facility is just the latest sign of the revival of a decades-old dispute in bilateral ties. On August 1, the Malaysian government inaugurated a new maritime base near Pedra Branca, an outlying island that is now under the jurisdiction of neighboring Singapore but which Kuala Lumpur still believes is part of its territory. Though construction of the facility had already been completed last year, its unveiling was just the latest sign of the revival of a decades-old dispute that has long roiled bilateral ties. As I have noted before, Malaysia and Singapore have had a rather prickly relationship in the past and problems tend to arise in ties from time to time. Pedra Branca is a case in point. Though the International Court of Justice (ICJ) ruled back in May 2008 that Singapore had sovereignty over it after a decades-long row, Malaysia filed a new application to the ICJ last February to revise the judgment citing new evidence from documents discovered in British archives, with a separate application for interpretation filed this June. In doing so, Malaysia effectively revived the dispute and complicated a historically rocky bilateral relationship just as the country was gearing up for its next general election. As I have noted previously, the timing has led it to be read by skeptics as nothing more than chest-thumping by the government of Malaysian Prime Minister Najib Razak to desperately secure votes, especially in Johor, rather than simply an exercise of the Southeast Asian state’s right to pursue the any outstanding legal claims it might have (See: “The Danger of Najibizing Malaysia’s Foreign Policy”). Last week, in yet another related development, Malaysia unveiled a new maritime base near Pedra Branca. The Abu Bakar Maritime Base, built on the Malaysian-owned Middle Rocks, which consists of two clusters of rocks and lies just one kilometer away from Pedra Branca, was inaugurated by the Sultan of Johor, Ibrahim Ismail Iskandar, along with other defense officials including Malaysia’s navy chief Ahmad Kamarulzaman Ahmad Badaruddin. 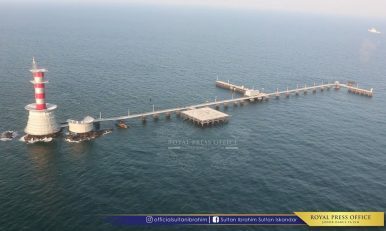 According to a video statement released by the Royal Press Office of the Johor Sultan, the facility, which was completed almost a year ago on August 29, 2016, comprises two buildings around 316.6 meters apart, including a jetty, a lighthouse, and a helicopter landing pad. The facility, the Sultan said in a statement on Facebook, was being used by various Malaysian agencies including the military and police, was part of a project under the National Security Council, and was aimed at both safeguarding Malaysia’s sovereignty and conducting marine scientific research. The high-profile unveiling of the facility received wide coverage in Singapore media. And though the Abu Bakar Maritime Base in Middle Rocks may do very little to affect the actual outcome of the Malaysia’s bid for a revision of the Pedra Branca ruling, it nonetheless suggests that, at least for now, this issue shows few signs of disappearing from the bilateral relationship anytime soon. Development comes just over a week after Abu Bakar Maritime Base was first unveiled. The Danger of Najibizing Malaysia’s Foreign PolicyWhat’s Next for the Malaysia-Singapore Pedra Branca Dispute?Malaysia’s New Army Chief Makes First Singapore VisitWhat’s Behind Malaysia’s New Defense White Paper Talk?What’s Next for the Malaysia-Singapore Border Disputes?